Avoid burning your cookies by choosing the cookie sheet carefully. 1 Does Heat Transfer Evenly Through Different Baking Sheets? 2 What Metal Is Good for Baking Cheesecakes In? 4 Can I Make Brownies With Confectioner's Sugar? Burnt cookies are bitter and unappetizing. Baking is at least partly science and when one ingredient is incorrect, the end result may not go according to plan. Reading the recipe is important, but even reading and following the recipe appropriately can lead to burnt cookies. The issue often boils down to an ingredient error, baking temperature issue or the wrong type of pan. Follow your recipe closely, measuring out each ingredient as specified. Too much sugar or butter can lead to a burned cookie. This is because these ingredients tend to burn at higher temperatures, especially on the edges and bottoms of the cookies where the ingredients come into contact with the hot surface. Follow the instructions on the size of the cookie. Making cookies too small can cause them to burn, especially at a higher temperature. Make all the cookies a similar size. Having different sizes can cause a few to burn before the others have had time to bake properly. Use a heavy-gauge aluminum cookie sheet with a dull finish on the surface. A dark, nonstick cookie sheet can make the bottom of your cookies burn. This is because a darker pan absorbs heat unevenly, cooking the bottoms of your cookies before the remainder of the dough cooks. Lower the heat by 25 degrees Fahrenheit when using dark, nonstick pans. An insulated cookie sheet -- a cookie sheet that is thick due to an inner layer of air between two layers of metal -- can help reduce burning because it takes longer to heat up. Turn on your oven at least 10 to 15 minutes before baking your cookies. Placing cookies in the oven while it’s heating increases the likelihood they’ll brown or burn on the bottoms. 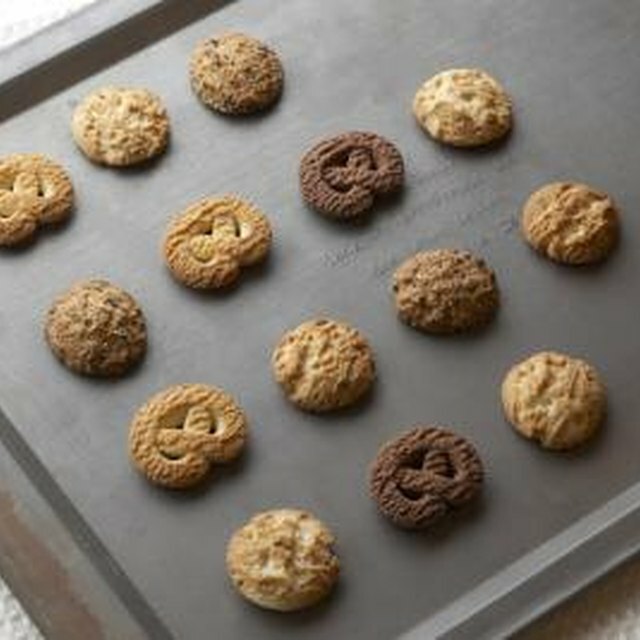 Reduce the heat on your oven by 5 to 10 F if you notice the bottom of your cookies are burning before the tops have baked through. Remove cookies from the cookie sheet right out of the oven. 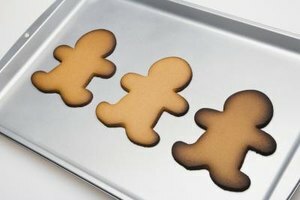 Leaving cookies on the hot baking sheet allows them to continue to cook and can scorch the bottoms. Place them on a wire rack to cool. Can I Bake a Homemade Pizza on a Pan With Holes in It?